Bridal gift set of embroidered lace edge Bride handkerchief and white lace garter belt, hanky personalised with your special wedding date. Bridal gift set of embroidered lace edge Bride handkerchief and white lace garter belt, hanky personalised with your special wedding date. 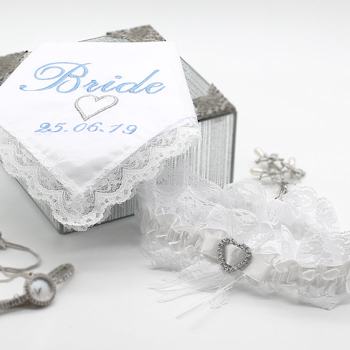 Beautiful cotton with polyester floral lace trimmed white handkerchief ladies size 28cm embroidered with a silver love heart the word Bride monogrammed and then your own personalised date in a text thread colour of your choice. Brides garter belt is elasticated white satin with pretty lace trim and decorated with white satin ribbon and a silver diamante love heart. Bridal gift set of embroidered lace edge Bride handkerchief and white lace garter belt, hanky personalised with your special wedding date. Beautiful cotton with polyester floral lace trimmed white handkerchief ladies size 28cm embroidered with a silver love heart the word Bride monogrammed and then your own personalised date in a text thread colour of your choice. Brides garter belt is elasticated white satin with pretty lace trim and decorated with white satin ribbon and a silver diamante love heart. Both bridal accessories can be presented in either a sheer organza gift bag or black gift box tied with a ribbon.